I Plan on making this a 'where do I find this' thread for things. We will include ores and items as of .70 as locations have changed for A lot of things. If you have any questions on locations, we can answer them here. Then, I will update the OP with frequent questions and their answers. When giving answers for location of ores or herbs, please give approximate coordinates. Guess I went a little over board on the RP also known as one day I didn't feel like doing much of anything...Anyhow here's a metallurgical survey of the southern grassland area. Coordinates are as close as the system allowed me...near enough for close up scanner use. I do have a question, I am new to the game and I understand how to use the scanner now. However I can't find oil ANYWHERE lol! can someone maybe help me out please ? I read the post i was just curious if thers a spot where it normaly spawns more? like close to water or is it random ? Alright then. I'll edit this with anything interesting I spot with the scanner. First up, there's a new aluminium deposit right next to the meteorite crater (11444,6859). Run a scan from the Camp Carter side of the crater and you'll see two deposits a fair way underground. At the crater itself, the iron's still easy to find. The copper's a littler trickier....you have to use the scanner and dig down a little. There's a deep copper deposit at 12001, 7230 or so. Run a scan from there and you'll find it. 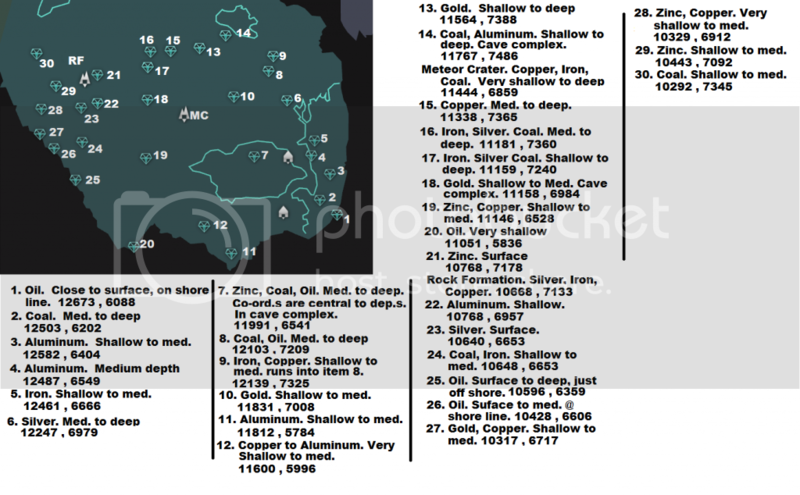 There appear to be massive aluminium deposits around 11838, 7547. The scanner's been giving me trouble lately but I'm fairly confident it's aluminium, not copper or iron (the other things I usually scan for). There's a cave system around there as well, but I think the deposit doesn't intersect with it. Nothing else on the scanner there. There's a lot of oil at 11830, 7832. Good luck mining it though, because a decent bit of it is below water. There's enough stuff above there to mine if you're patient or like digging away an entire hill though. There's a decent sized coal seam at 10228, 7301. Like a lot of stuff, it's quite deep. I haven't dug down to it so I can't say if it's above or below the water table. Edit: Interestingly, there's actually coal at the Meteorite crater as well. Didn't see it on the scanner, but when I was mining iron inside the crater rim I ran into it. Edit2: Aluminium at 12500, 6565. Very close to the Carter camp. Also a large deposit. There is a downside...the quest mobs re-spawn on reloading the game! I did the quest then dug my mine deep enough to get away from the mobs...hoping I will be able to get back in before dying, if not I will dig a tunnel from the coast area. I just want to know where is the mineral scanner for adventure mode? Its becuase it has the some hotkey as Help and Shop... and it shares the section with the Help Section... the problem is, in adventure is that there is no Help menu, just the shop. Bump because it was missed: large Aluminium deposit at 12500, 6565. Very close to the Carter Camp, but a reasonable way down (I tunnelled into it from the coast to keep the workings nice and flat and it took a couple of iron picks....but I only did that because I like the third-person camera. Digging a steeper tunnel would get into it quite easily). I guess 0.7 is pretty well off in terms of the stuff. Now I just wish I could get the handheld PC to default to "scanner" instead of "help" when I click the button. Ah well. It'll be interesting to try this out in Adventure mode when we get scanner access. At present, there's always some ore around a place with a quest that needs ore (at least, in the early campaign). With Adventure mode being randomised, that might be quite different, and change things up a fair bit. Awesome thanks for letting me know. I just wanted to make sure I wasn't going mad and maybe it was hidden somewhere as something you had to make etc. If not, will there be another contest?